Do you remember the last time it was raining and very windy in Pagham on a Saturday – what on earth did we used to do? Well, it seems that everyone chose the same activity today as they all rolled up at St Thomas à Becket Church to see and experience The Story of Pagham Weddings. If you wished to trace your family tree – there, displayed on either side of the aisle were Parish Records of weddings dating back to the 1800s. 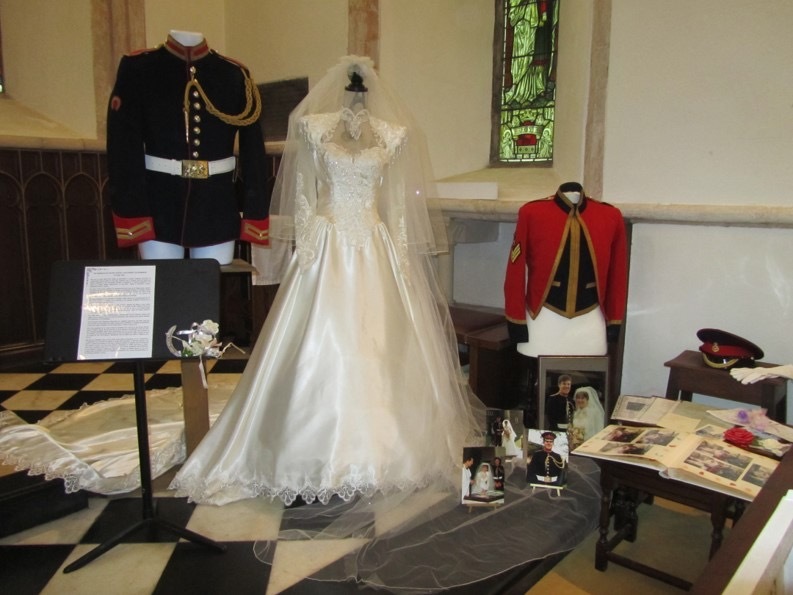 It was so very moving to read the honest and humorous accounts of the wedding days and the preparations beforehand, all displayed on music stands. It all set bells ringing in our ears about our own ‘lovely days’. Oh! Yes!! Twice during the day, the 6 bells in the steeple were rung by our regular team which added to the joyous atmosphere. Just as we were trying to recall the hymns we had chosen for our own wedding days, – music played on organ and piano could be heard from ‘The Wedding March’ – ‘The Arrival of The Queen of Sheba’ – followed by the most requested hymns throughout the centuries. ‘Lead Us, Heavenly Father, Lead Us’ ‘Morning Has Broken’ and ‘Fight the good Fight’! !’ were all sung by the choir. It was so interesting to see how styles of wedding dresses had changed throughout the years, the long trains and veils and ‘leg o’ mutton’ sleeves. One Victorian dress had a waist of at least 10” oh! and there was a styling head (created by teenager Sophie Steen) showing the elaborate hairdressing for those days. Requests for dummies on which to display the dresses and suits were to be read on the Church notices for weeks, and on the day, would you believe it, there were exactly the required number! One bride and groom actually modelled their wedding outfits – they were married 2 days after Christmas 3 years ago, in the Church, filled to capacity. ‘Till death do us part’ Ha! We were young – that would never happen. ‘ . . . and the two shall become one flesh’ – what was that all about? The older brides and widows amongst us knew and understood exactly what that meant. You really would rather suffer yourself than see your partner in pain. There were three Vicars circulating and enjoying conversations with those whom they’d married: Rev Mark Eminson – our present vicar, his predecessor Rev Keith Smith, and before him Rev John Maynard, who all took up the microphone and regaled us with their memories of those shared holy moments. How could we leave it so late to comment on the magnificent floral displays everywhere created with such loving care. Everyone was talking to everyone else and sharing their memories – there was much laughter and jollity and a few quiet tears, remembering, remembering, a wedding long ago. To bring us down to earth – teas, coffees, tasty home-made soups and cakes were on sale all day long, thanks to the orderly rotas and willing cooks and bottle washers. Memories from long ago, to recent ones, and high hopes of days to come, for those who take the wonderful step of promising before God and the congregation to keep faithful to one another throughout their lives. Thank you so much to all the team, for making this idea and dream come true and giving us so much pleasure in preparing for it or attending it. It will be an everlasting memory for us all. Approximately £2000 was raised by this event, which will go to our Roof Appeal.